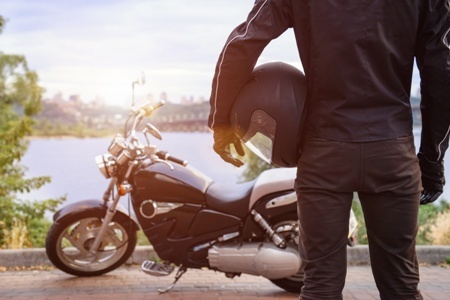 You probably already know that motorcycle accidents are quite dangerous, but if you’ve been the victim of one – or if someone you love has – you likely have a new, and terrible, appreciation for their consequences. If you’re struggling with a motorcycle accident in your recent past, or further back, get the help you need today. While motorcycle accidents don’t happen more often than other types of accidents, because of the relatively limited protection riders have, they are often more deadly – 35 motorcyclist deaths for every death occurring to a passenger in a car. They also lead to serious injury much more often. No matter how careful you are as a motorcycle rider, sometimes you can’t be careful enough to avoid an accident. If you have been the victim of a motorcycle accident, there’s a good chance you can get compensation. Before you do that, however, you must do your best to respond intelligently to the accident and document everything you can. If you’ve already been in the accident, it may be too late for some of these, but do whatever you can. If you’re ready to get in touch with an attorney to help you get the compensation you might be owed for injuries, failure to work or other adverse consequences resulting from an accident, don’t wait. Many motorcycle accidents are the result of another driver’s negligence, which means you can get significant compensation for what has happened to you. That is only true, however, when you work with a reputable attorney who has experience in this type of case. Luckily, Williams & Williams Law Firm has a long history of representing victims of motorcycle accidents. We can help you, too. Call us at 770-823-2711 to get started on your free case consultation. We look forward to informing you about your options and making the best possible plan for you.